In 1996, The Simpsons aired an episode called ‘22 Short Films About Springfield’. One sketch from this sees Principal Skinner burn a roast he was cooking to impress his boss, Superintendent Chalmers, and attempt to secretly replace the food with ‘steamed hams’ (hamburgers) from a nearby Krusty Burger. He gets caught in a web od ever-escalating lies, and at any moment Chalmers could uncover his scheme and the dinner party would be ruined. If you’re not already in the loop, the scene has since been intensely memed, and the internet flooded with hundreds of re-imaginings, recreations and remixes. Just as the original scene skewers sitcom tropes, the steamed hams meme constantly deconstructs and reconstructs the familiar narrative, and reimagines these two classic Simpsons characters in more ways than a single person can come up with. To save you some time, this article runs down the best of these crowd-sourced skits. A remix in this case is any video which re-orders shots from the original scene in order to tell a different story, such as ‘Steamed Hams but Skinner is honest about everything’, which manages to reverse almost everything Skinner says seamlessly. A parody would recreate the scene using other materials – for example, ‘Steamed Hams but recreated using only Seinfeld clips’. Often however the videos don’t fit neatly into either of these categories, and incorporate elements of both. The surrealist ‘Steamed hams but it’s in 3d’ recreates the scene using semi-human 3d models, text-to-speech audio and a bunch of absurd surprises. For the most part this video is haunting and unnerving, with comedy coming as sudden relief, like in a David Lynch film. There also exists a similarly-rendered ‘Steamed Hams But it’s a 360/VR Experience’. As well as being a feat of technical brilliance, this video is almost unique for its presentation of a new perspective on a familiar scene. While the scene usually follows Skinner, this video places a viewer in the role of Chalmers as he witnesses Skinner’s plan collapse, and almost foils his cover-up. As well as parodying Steamed Hams itself, these videos can sometimes incorporate elements from other media to parody something else. ‘Steamed Hams but it’s a mission in GTA San Andreas’ flawlessly integrates the game’s cutscene structure and heads-up display to bring the steamed hams story into the GTA world. Another nostalgia-inducing game adaptation is ‘Steamed Hams but It’s a Mod for The Simpsons Hit & Run’, which overlays audio from the scene onto the action and audio of the game. Both of these videos have moments of comic brilliance, as well as a painstaking attention to detail which brings together disparate worlds in a surprisingly satisfying way. For variety there’s the impressive (albeit slightly hit-and-miss) ‘Steamed Hams but There’s a Different Animator Every 13 Seconds’. For flawless execution (in more ways than one), there’s ‘Steamed Hams but it’s Pulp Fiction’, which overlays the faces of Simpsons characters onto characters in the film world, and points out the striking similarities between two scenes involving tasty burgers. An honorary mention should also go to ‘Steamed Hams but I’ve seen so many Steamed Hams videos that I try to recite it from memory’, a feat as impressive as it is ridiculous. This video, perhaps more than any other in this article, is a testament to the knowing redundancy, pointlessness, and ironic enjoyment which characterises the whole steamed hams movement. Whenever a video goes viral, there are some musical versions which are inevitable. There are of course mash-ups of steamed hams dialogue and Smash Mouth’s ‘All Star’, Childish Gambino’s ‘This Is America’, and a particularly annoying version set to the Mii Channel music. However, there are also a handful of musical steamed hams videos which are well worth your time. A surprisingly effective combination is ‘Steamed Hams but It’s Vocoded to the star-spangled banner’. Either through painstaking minor edits or incredible luck, the scene follows not just the tune of the song but the rhythms. The music lulls and crescendos in time with the dialogue, and both even climax at the same time. It’s as if one was written to accompany the other. Speaking of which, the next musical adaptation we’ll see actually does feature original music composed around the scene. “Steamed Hams But It’s A Piano Dub” is a single-take shot of a keyboardist flawlessly play along to, and riffing off of, the scene’s audio. Sometimes he’s in time with what they’re saying, and at other times skirting around it to provide a fitting background. Switching between these, encompassing a range of musical styles and skits, the perormance is inventive and playful and incredibly satisfying to watch, and may be my personal favourite of all the steamed hams. Finally, there’s ‘Steamed Hams Inc.’. This Gorillaz-Simspons hybrid is standout for a number of reasons: 1, the song ‘Feel Good Inc.’ is a banger, and this full-length video maintains those same party vibes. 2, the lyrics are replaced with expert precision, unbelievably not missing a single beat. 3, the image track is also synchronised with the music. When a new line is said the character delivering it also appears. When multiple lines are layered over each other you get multiple cut-outs of the same characters simultaneously, so that the screen fills with shapes and gets chaotic at the same time as the music swelling. Not just one of the greatest steamed hams videos, but one of the most accomplished meme-remixes of all time. If you’re a fan of formal experimentation, definitely check out ‘Steamed Hams 10 times, sync point when Chalmers says “Aurora Borealis”’. Here, ten videos play simultaneously, each starting later but playing at a faster speed than the last. Each video and adds another layer of distortion to the audio track, and this cacophony intensifies until the sound becomes unlistenable. But then, just when you’re about to move on, something beautiful happens. All ten versions of Chalmers say “aurora borealis” simultaneously, chaos becomes order, and there is a brief moment of perfect clarity. It’s euphoric, and every bit as beautiful as the real Northern Lights. There are also some videos which employ arbitrary variables, and still produce moments which are genuinely funny. 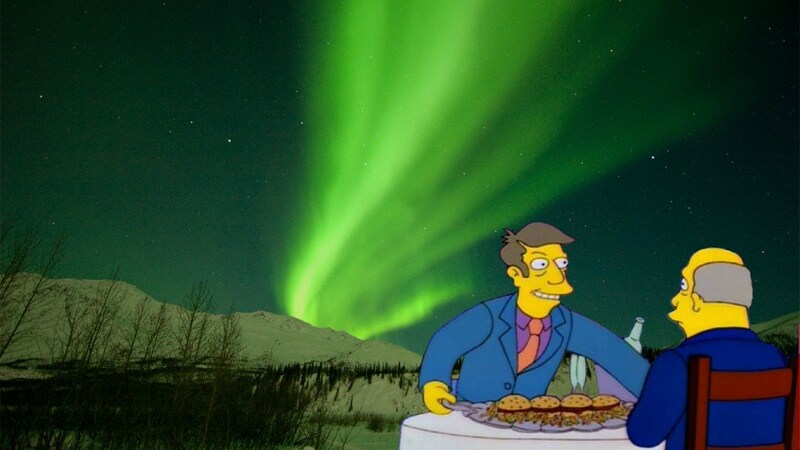 ‘Steamed hams but every 5th and 7th word is replaced with “steamed hams” and “Aurora borealis”’ creates comedy just by chance, producing one absurdist non-sequitur after another. Similarly, one of the funniest videos out there is ‘Steamed hams but every word is replaced with its first occurrence’, which quickly descends from a normal playthrough of the scene into a mess of rapids cuts and one-second-clips. This works so effectively because, despite the erratic cuts making the video feel out of control, it’s still entirely coherent. You’re surprised each time the scene cuts away, and yet not surprised at all, because what you hear still makes perfect sense. The sound track remains intact, but the visual track makes no sense. This exploits what some psychologists call the uncanny, the gap between recognition and not. When steamed hams is combined with a movie or game, which in our minds was previously disconnected from The Simpsons, our brains get over-stimulated because we’re seeing two different things simultaneously. It’s surreal and bewildering and sometimes unnerving, but often, very funny. By now the sheer range and scope of these video remixes might feel immense – and we’ve barely scratched the surface. On the day of writing this article alone, 54 videos were uploaded to YouTube with titles beginning “steamed hams but…”. Expand the search filter to display results for the whole month, and this figure shoots up to 6’130 unique videos. By the time this article reaches you, this number will have grown again, and will continue to grow faster than anyone can possibly keep up. There will be undoubtedly be some absolute gold that this article hasn’t covered, simply because I’ve not been able to find it. There are treasures buried online. It’s time to get your spade.